1. Preheat the oven to 180°C, gas mark 4. Put 1 tbsp oil in a large frying pan over a medium-high heat. Fry the onion with a pinch of salt, stirring regularly, for 10 minutes, until deep golden. Drain on kitchen paper. 2. Meanwhile, put the spinach in a large colander and pour over just-boiled water from the kettle to wilt (you may need to do this in 2 batches). Rinse under the cold tap, then squeeze out as much excess water as possible. Drain thoroughly on kitchen paper. 3. Add the remaining ½ tbsp oil to the frying pan and toss in the spices and garlic. Fry for 1 minute until fragrant, then add the spinach plus a pinch of salt. Cook, stirring, for 2-3 minutes until any excess water has evaporated. 4. Splash the naans with a little cold water and bake in the oven for 3-4 minutes. 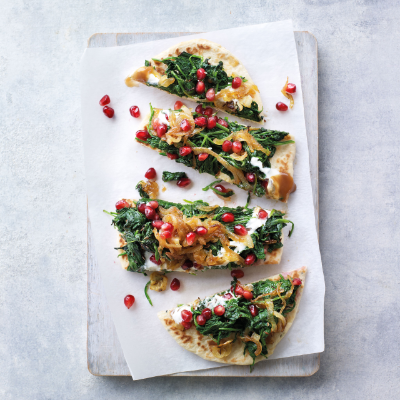 Remove and top each with the spinach, onion, tamarind paste, a drizzle of yogurt, and the pomegranate seeds. If you fancy a more substantial meal, top the fl atbreads with some crumbled feta instead of yogurt.